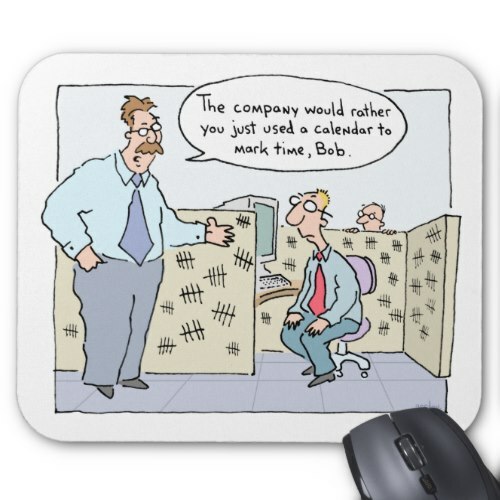 The company would rather you used a calendar to mark time..
A funny, hilarious, office humor cartoon mousepad featuring Bob the office worker in his cubicle, being counselled by his supervisor on a more appropriate way of marking time at work. Fun mousepad to add a touch of humor to your workspace. A dust and stain resistant mouse pad, with non-slip backing, perfect for your computer desk at home or office. Makes a great gift for birthday, holidays, christmas, for friends & family who hate their job or work environment, office workers, colleagues and peers at work.